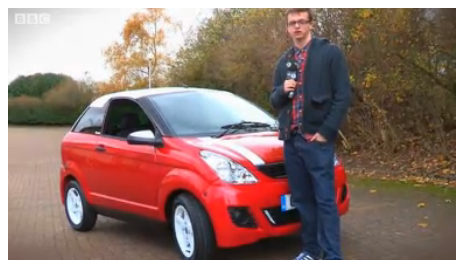 … the Government plans to introduce in January 2013 so called “Moped Cars” – for 16 year olds! I might also put myself “out there”, tarring an entire section of society with a wide brush in the process, and suggest that any 16 year old able to afford a £10,000 Light Quadricycle is unlikely to be the most grounded and responsible of individuals! “It was actually quite easy to pick up, even for someone who’d never driven a car before.” Said the gangly Jack Hogan, and therein lies the problem. Everything’s easy and nothing’s in the slightest bit dangerous when you’re 16 (or 17 for that matter but for God’s sake let’s not encourage them!) and certainly nothing is every going to happen to you in the cocoon of your safety cell if you should have a little prang. Not everyone is going to come off quite so well though hey. As a motorcyclist and car driver of over 20 years the roads are most definitely a much more dangerous place now than when I started driving/riding. Sure the cars themselves are safer for the drivers and passengers inside, but it still hurts just as much when one hits you. Safer for the drivers, who are lulled into a false sense of security. Jeremy Clarkson’s idea of replacing the centre nut of the steering wheel with a 6″ spike holds a lot of ground with me! That’s the problem with many of the vehicles that almost collide with me on a daily basis, the nut that connects the steering wheel to the drivers seat. The daily commute is already a minefield of distracted, cocooned drivers with poor observation, poor signalling (since when was MSM, mirror signal manouevre phased out and replaced with MMS, manouevre maybe signal) and general lack of consideration… and don’t even get me going on the cyclists who flagrantly disregard every roadsign and traffic signal yet who are the first ones to point the finger, or raise the finger, when you almost knock them off their unlit bicycles because they’ve run a red light or hopped off the pavement in front of you. So we really need to introduce a whole new batch of newly-unqualified drivers in to the mix? I still maintain that all new motorists should be made to ride a scooter/motorcycle for at least one year in order for them to gain an appreciation for other road users, how the road system actually works and just how vulnerable everyone who uses the roads really are. Driving instructors don’t teach you to drive, they teach you how to pass the test. Simple as that. The day you pass and get your licence is the day you really start learning and by then it’s a little late. I genuinely despair. Going to need to reload the cannons and beef up the armour on the GS for this one I think!